Have you thought about pursuing graduate study in Asian Studies or a related field? How do you know whether a graduate study (a Master’s and/or PhD degree) is right for you? How is graduate education different from undergraduate education? How do you choose a program, how do you apply, and what will it cost? What is the grad school experience like, and what is the value of a graduate degree? This evening event will answer these questions and more, including your own questions in informal discussion over a light dinner. 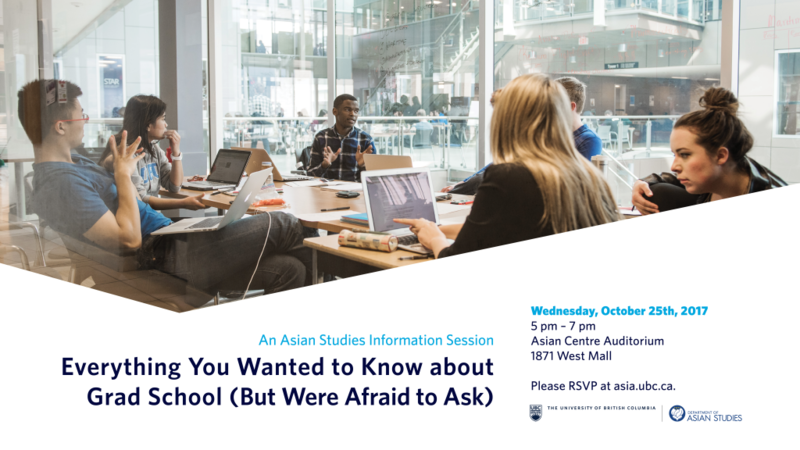 The event is open to all Asian Studies majors and minors interested in graduate education at UBC or elsewhere, and to anyone interested in applying to the UBC MA or PhD programs in Asian Studies. Speakers will include faculty, current graduate students, and recent graduates.